Homing Requirements: Mr. Beffy needs an experienced terrier home, conversant that small terriers are not soft toys and have BIG personalities. Mr. Beffy needs building up not only his weight but his confidence and as he achieves this his reactions will mellow. NB we have only ever observed him as receptive and welcoming. He has reportedly failed 2 homings from the pound but in our view since he came to us in a terrible state these and these 2 homings didn’t even bath him or offer him the most basics of care and they were not home checked, so should not reflect in any way on Mr. Beffy. 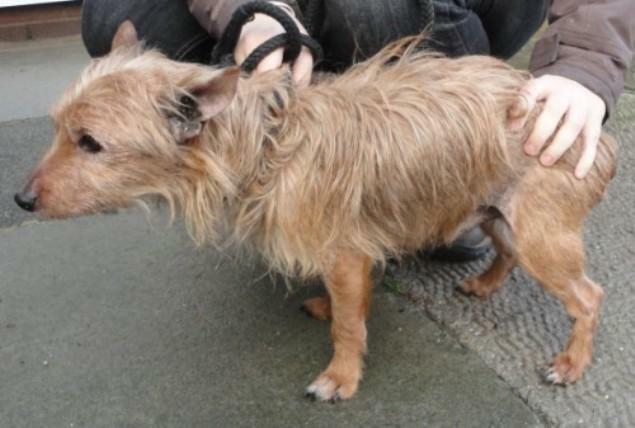 His Story: Mr Beffy found himself in a pound who homed him twice without home checking and he was obviously taken on looks and returned for being nothing other than a terrier, without bathing, vaccinating or any evidence of care given. He is very amenable in kennels and around meeting other dogs. He needs out of kennels as soon as possible. Mr. Beffy is neutered, has had a full dental and no teeth needed to be removed, was wormed, chipped and is being vax'd. Advert: Mr. Beffy is a sweet love who finds himself in a harsh environment in terms of winter kennelling and also having passed through innumerable sets of hands without basic care. He is not reactive to dogs around the kennels or out on his walks. He is easily cuddled and picked up. He needs a stoic terrier family who are going to be there for him if within a home setting he starts to become a dynamic terrier which of course he is. Travels well in a crate in the car. Mr. Beffy is a Yorkie cross. Just 5 kilograms weight when we collected him. He certainly isn't Mr Beefy! He needs tender loving care with a secure garden and exit management and to be loved as we love him. Interested in homing Mr Beffy? Please visit Mr Beffy's thread on our forum to find out if he is still available and for fuller details. For daily updates Click our forum link and you will find the full range of dogs available for homing. Mr Beffy comes on Sunday bless him don't know where we will find these kennels from saving about 6 next week!